After a lot of argueing and discussing, it was suggested to continue on the forum. If the megarom has a negative effect on entry-count then I'd like to invite last year's participants, who don't compete this year, here to discuss along. - a group who want to make retro/old/small games, truly not meant to be big games (in a way UU and The Cure are exceptions in last year's competition already, not so much for ROM size, but more in terms of gamesize/concept). In a way (I don't mean it very negatively!) this group could be seen as conservative towards MSX1. Which, on its own, is not bad ofcourse.. it's, say, 'loyal'. - a group who want to squeeze the last drop from the MSX within the limits of the competition. Specs to beat Konami with. That alone is quite scene'ish. It's usually a scene (also on other systems) who wants to beat official companies and softwarehouses by doing the same product in the same quality.. but then as scene, thus 'amateurs'! From this urge to outrule 'the system' as a 'rebel', a lot of initiatives came. So this urge is good. I actually believe the 3d cards on PC (mid 90's) had quite some PC demosceners involved, as those sceners were clearly doing superfast 3d already, years before cards like 3dfx came. So, as Konami made megaroms, and even 2megaroms for MSX1, you can bet that the rebels want to outperform that. Compression is in vogue recently (thanks to bitbuster), so it's highly appealing for these rebels to actually fit a double sized ROM in a ROM.. (2m in 1m, 4m in 2m). Those are developments I like, it simply raises the quality. From that pov it's highly sad that TNI and XL2s withdrew their entries. So, this second group could be called 'progressive'. You could perhaps summarize this 2nd group as MSX2 developers, who also have an MSX2 history, who make insane turns and twists to fit their games into an MSX1 ROM. The first group could perhaps be summarized as genuine MSX1 users. So, towards which type of user was MSXdev '03 '04 and '05 aimed? I think it's clearly the first group, with UU and The Cure being the rebels, because these games would've clearly been MegaROMs if they were produced in the 80's. The interesting question ofcourse is.. 'towards which type of user is dev'06 aimed?' ! Wolf, I like very well your analyse and it seems to be in relation with 2 different MSX levels of popularity. In countries such as Japan and the Netherlands, because MSX2 (and higher for Japan) was a real commercial success, MSX1 development seems not so attractive although you can produce excellent games also on this platform. I remember the remark on Gigamix when presenting MSXdev'2006 : they were speaking about a MSX1 contest although MSX2 is viewed as 'the real standard' in Japan (and when Japanese speak about MSX2+ and Turbo-R, it's from their pov just enhanced MSX2's !). In countries such as Brazil and Spain where the MSX standard was introduced lately, MSX1 is more populair than MSX2. And we can understand why the MSXdev' contest is first and mainly a MSX1 contest, as it has been created by a Spanish MSX fan and developer. 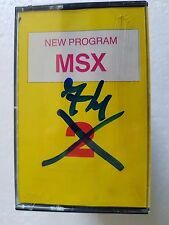 Also in this 2006 edition, the contest is first a MSX1 contest, although for the first time bonus points can be given for extra features, what includes MSX2 (and higher) features. If I take a look at the amateur revival from the gamer's side, there's also an evidence : the most populair classic games are ... Konami games. 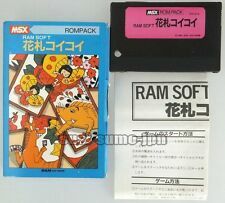 Most of them are MSX1 games, but Konami has also released some giant MSX2 games ! As said by wolf, you can see the MSXdev contest as an opportunity to show that amateur talented developers can now do it better on a technical side than Konami ! But other developers will only to create a game with the same level of intuition and creativity than Konami. And in some cases, you can try to combine best of both worlds !!! Bigger specs -> Bigger expectations -> More ambitious projects -> More time required -> More cancelations. Then, what we've got here is a big dilema. And it is up to the MSXdev team decide about it, of course, paying attention to the community's feedback. As a programmer, I would say that I want big specs. Well, just bigger MSX1 specs ;) (first generation forever). As a user, I would say that I just want more new games. I prefer a simple but released game rather than a bunch of canceled promising projects. The original purpose of MSXdev was to revive the MSX1 developement. MSX1 scene was almost dead because most developers were focused on MSX2 systems. What is positive about it is that it has helped the whole MSX community. Let me explain this: a MSX2 developer that programs for MSX1 has to be more creative, program better and optimize both code and data size. This technical improvements will help any further development for any platform. I would like to know your views on this topic. But maybe it would be better to start a new forum thread and discuss this subject properly. So, this is the spot where we continue, in a nutshell: do raised specs for MSXDev'06 scare away developers? Are there two major groups to identify (conservative msx1 and progessive msx2)? What should MSXDev'07 look like? give penalities for the use of high specs. Thanx Wolf, for ignore my arguments in this discussion. Is normal, Spain is a Third World for you, true? Your you cannot support that a Spanish or Brasilian guy, says things with sense, truth? I think that language is here once more an unsurpassable barrier. Language is not only words and grammar, it is also culture and differs from country to country. I would suggest to calm down the discussion and try to reach a win-win strategy in this thread. We all want to improve MSXdev as a major MSX game development event! Of course, I had the same problem in the past and I have delighted the MRC forum with nice quarrels about minor issues. Remember the GL topic and the Pitpan vs. Guyver flame war? Luckily enough, I am older now - I wouldn't say wiser. JJ: I would suggest you to join also http://forum.karoshicorp.com , the Karoshi forum, where you will have first-hand information about MSXdev'06 contestants (mainly the Spanish groups). I don't care anymore. Just as long the new rules will NOT go from "128kb ROM - 16kb RAM" to "48kb ROM - 32kb RAM". This will only move the problem from code wise problem to a storage problem. It wouldn't make sense for me. - Putting the ROM limit from 128 to 48kb will surely mean one less entry next year. Our entry will be surely disqualified/withdrawn as it will be become impossible (but thats not a good argument I guess). @JJ: Please stop you're not making sense. Don't start taking things on a personal level. This is the big problem. Spain is only this: paella, fino, torito, jamon ... This is a patetic image for this land... Not all people in this land is "torero". I don't want create big discussion, but I believe that ignore my opinions, like if I'm stupid or silly boy, is the first racism. My opinions are direct, I know. But my english is reduced, and for me is very hard explain my ideas with other words. No problem. I hope that the people understand my ideas, and think what is the problem in MSX in this moment. I believe that more people think same things, but they have fear to write this. pitpan: Thanx for your offer. In this moment I'm registered in this forums. Well, back to the MSXdev'07 specs topic! Ok. My excuses for all people. My exuses for untouchable people. I'm bad boy, but I'm sincere and humble. I hate hypocrisy. Please, don't do it. As you are an MSXdev'06 contestant, is nice for the MSXDEV Team to have your opinion here. Just stay on topic, ok ;)?. Add another sidenote: games with this configuration can easily be produced in cartridge format. I mean *REAL* cartridges using Matra's SHOCKWARE. That's the best thing! The lovely noise of inserting a brand new cartridge in your good old MSX! And that could be the best prize for the contestants: have your own game published. But -once again- I'm just a "loyalist". For me, 48 KB+compression is enough!